What would you do if your income was taken care of? Just a few years ago, an unconditional basic income was considered a pipe dream. Today, this utopia is more imaginable than ever before—intense discussions are taking place in all political and scientific camps. 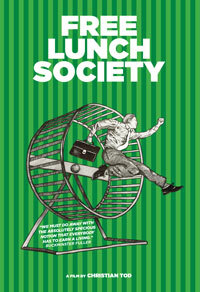 FREE LUNCH SOCIETY provides background information about this idea and searches for explanations, possibilities and experiences regarding its implementation. An unconditional basic income means money for everyone - as a human right without service in return. But is this concept a visionary reform project, neoliberal axe to the roots of the social state or socially romantic left-wing utopia? Depending on the type and scope, a basic income demonstrates very different ideological visions. Which side of the coin one sees depends on one's own idea of humankind: inactivity as sweet poison that seduces people into laziness, or freedom from material pressures as a chance for oneself and for the community. Do we actually need the whip of existential fear to avoid a lazy, depraved life in front of the TV set? Or does gainful employment give our lives meaning and social footing simply because we haven't known anything else for centuries? That basic income is a powerful idea is indisputable. From Alaska's oil fields to the Canadian prairie, from Washington's think tanks to the Namibian steppes, FREE LUNCH SOCIETY takes us on a grand journey exploring one of the most crucial questions of our times. Featuring internationally renowned social scientist, scholar, and activist Frances Fox Piven and professor of economics and director of the Center for Equitable Growth at the University of California, Berkeley Emmanuel Saez. An ambitious and accessible six-part series that looks at both the history of ideas and the social forces that have shaped the capitalist world. After the coup in 1973, Chile was turned into a laboratory for the world's most radical neo-liberal experiment. As a team of managers in Gambia try to build a microfinance business, they learn that the loans may be small - but the stakes are very high. Documents the efforts of the multinational corporation Philips to reach five billion potential consumers among the world's poor. Can profitability fight poverty?